Would You Eat a Dish Called the ‘Julio Lugo’? With the smooth-running corporate glamour of the U.S. Open upon us — over 700,000 visitors last year, 1,765 credentialed members of the media and some $200 million in revenue — it's easy to forget how difficult it is for non-Federers to actually play tennis in this town. 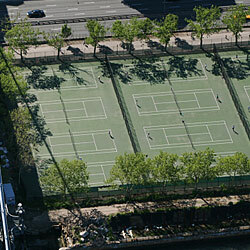 New York could be an urban tennis paradise. It really could. Across the five boroughs, there are 550 courts to play on, and a good many of them are in decent condition. But too many have become lawless, hostile, and dysfunctional zones of confusion and discontent. One might assume that for all the alleged managerial brilliance of the Bloomberg administration, and as part of Bloomberg's make-this-friggin'-city-easier-to-use mission, the tennis crisis would have been solved long ago. But Bloomberg's recreational interests are on the golf course, and inside his administration there is not one person who oversees a tennis program throughout the city. There's no program. The city has teamed up with nonprofits to run free programs for kids and seniors on the courts, but for the rest of us who are simply trying to hit a few balls, it's a battle. Last week, after getting juiced up watching the great Fed himself in action at the Open, I hoofed it over to East River Park 45 minutes before the hourly change. All courts were taken. Fine. I asked the attendee to be put on the waiting list. We don't do waiting lists, she said. Lauren Weisberg, a recently laid-off twentysomething, was waiting, too. She had prepared for her doubles match almost four hours before, trekking from the Upper East Side to Paragon to pick up passes, then busing over to East River Park. As she went over her gripes, Delphine, of France, showed up. She wanted to change into her tennis whites, but the bathrooms were already closed. Ergh! I strong-armed my way onto a court, got kicked off it by Delphine, then guilt-tripped the sweat-drenched players next to us to get off (they looked like they were in their twentieth set). By the time we left, players were trying to get on in the dark. "It's a free-for-all," one lady said. It also doesn't need to be this way. The employees the city hires to oversee the tennis courts are involved in a six-month welfare-to-work program. The result is a transient workforce that is paid $9.21 to rake leaves and keep the bathrooms clean. They were not hired for their love of tennis. "We have work to do on the customer-service aspect," says Parks commissioner Adrian Benepe. "On the other hand, the price is right." The city is missing out on revenue. Last year, they collected $1.9 million in permit fees — a "modest" haul, Benepe says. Who knows how much it could take in by selling permits on-site, and beverages, and tennis balls ... enough to hire a tennis-friendly staff? Some efforts to outsource tennis have been shot down by community groups worried about increases in price. "You'd think we were building a slaughterhouse or a nuclear-waste dump by the kinds of reaction we got," Benepe says. Tennis could be similar. The courts in some parks could be like Bloombergian charter schools, where everybody competes to keep courts accessible and prices down. Imagine it: Each park its own tennis center! People to answer the phones! Lights! Online reservations! Pro shops! More bubbles! Ideas on how to make this work, anyone? John McEnroe, tennis czar? The only problem with making the public courts easier to play on, of course, is ... well, they will be easier to play on, and that means more people will want to play on them, and if more people want to play them, there might not be any courts left to fight over. Or complain about. Geoffrey Gray is a contributing editor at the magazine. He most recently wrote about Manhattan district attorney Robert Morgenthau.